The scale, scope and depth of data supply chains are generating today is accelerating, providing ample data sets to drive contextual intelligence. 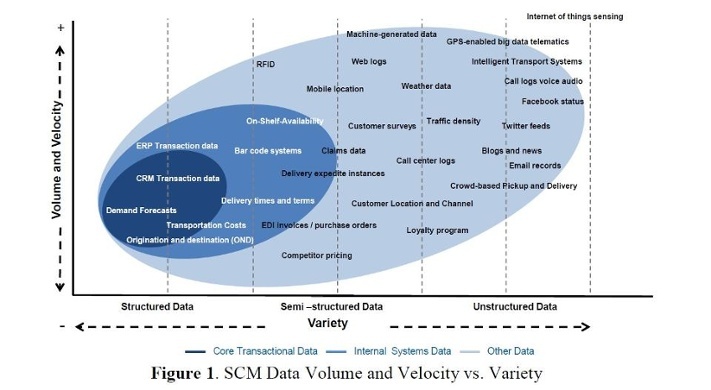 The following graphic provides an overview of 52 different sources of big data that are generated in supply chains Plotting the data sources by variety, volume and velocity by the relative level of structured/unstructured data, it’s clear that the majority of supply chain data is generated outside an enterprise. Forward-thinking manufacturers are looking at big data as a catalyst for greater collaboration.